How I got to be a B4 fan. I am Yuji in Japan. I was born in 1957. The first time ever I met The Brothers Four's music, when I was thirteen years old. When I was twelve years old I started to play the guitar. When I sang Japanese folk songs, a classmate (a girl) told me "What about 'House of the Rising Sun'?" I didn't know such a song! So I came back home and asked my brother (Keiji,5 years older than me). "Yes, of course I know." he said. Then he picked up a disk ("Souvenir For Youth") and showed me one. That was the song played by The Brothers Four. "This is IT! Thanks brother." Then I listened to it many times and practiced hard to play that song. Several days later, I played the song in front of that girl proudly. I asked that girl "How do you like it?" Then she said " I'm afraid this song is NOT the same as I know." The song she had heard was the song played by "The Animals". I didn't know the Animals at that time. Later kind-full Keiji gave me that "Souvenir for Youth" album. This become my first album of the Brothers Four. I listen and listen and listen to this "Souveneer from my brother" so many times. I practiced hard to play "Riders In The Sky" with my 6 string guitar like John in my 14yrs old. I got my first banjo to play "Darlin' Corey" in my 16yrs. I wanted to have 12 strings guitar to play "Silver Threads and Golden Needles" in my 17yrs. I came to know THERE IS A Pedal Steel Guitar in the world in my 19yrs. The Brothers Four's concerts gave me unforgettable happy feelings and memories. I've got those feelings for many times. In The Brothers Four's performances on recording, I like "When the Sun Goes Down" the best. It's very beautiful chorus and simple instruments accompaniment. I like to sing and play American folk songs, and bluegrass music, Dawg music, country music, classical and Jazz music . Especially I love The Brothers Four (Of course). All my musical experience is based on The Brothers Four. Also I like to play musical instruments such as 6-string guitar, 12-string guitar, bluegrass banjo, tenor banjo, pedal steel guitar, mandolin, bass, Dobro and so on. Do I look like The Brothers Four? However cannot make a chorus by one. Personally I am a pharmacist and work for a pharmaceutical company. I like to drive a car, also. 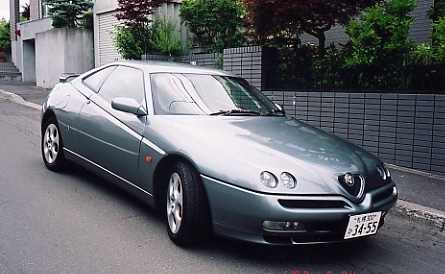 Now I drive Alfa Romeo GTV instead of ALFA ROMEO 156. It's fun, too! Now I drive Pugeot 308 SW for my large family. I remember this is a nice shot at Tokyo Kouseinenkin Hall back stage. At Choshi. 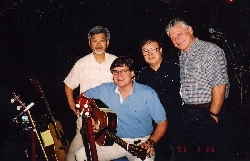 The last stage of 2003 Japan tour back stage..
John Paine kindfully lent me his historical guitar. I sang "Four Strong Winds" with Terry. The Live album "This Land Is Your Land" was recorded at "Kitara" concert Hall in Sapporo where I was born. "Kaitara" is the finest music concert hall for classic music. The man next to Bob is Otaru (Nick name), my true friend of mine, of course he is a big fan of the Brothers Four and the member of BFFB (The Brothers Four Fan Band) with me. Copyright (C) 2007 Yujil All Contents rights reserved.